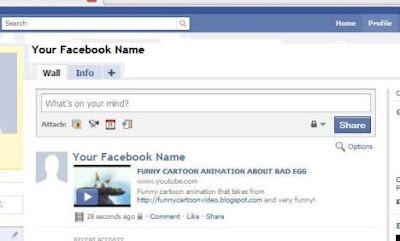 If you are one facebook users facebooker or true, of course, never occurred to you in tweaking your facebook wall to make it more beautiful and attractive. You can add pictures, video, or link to your blog or website in your mainstay. 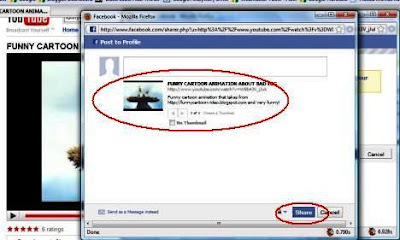 Therefore, the following I will show a simple way for you who want to add Youtube video box on your facebook wall. Hopefully this way is very useful for you to share your favorite videos from Youtube to your friends. The first step you should do is, of course, to find your favorite videos on Youtube pages. 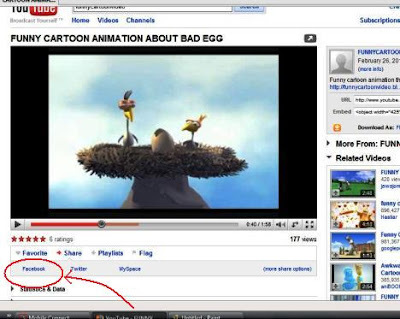 Then discover a link to Facebook which is usually located in the column Share under Youtube video box. More details see the picture below. 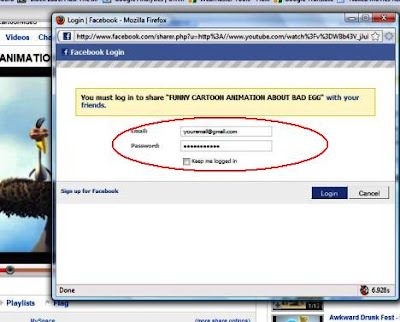 Then click the link Facebook and Facebook will open login window. Please login with your account and password. Then click "Login" button. After that wait a while until Facebook successful loading Youtube video box. Video image will appear to you if you succeed and then clicks the "Share". If you really step would have made your video uploads on Facebook has been successful. After that try to open your Facebook wall. 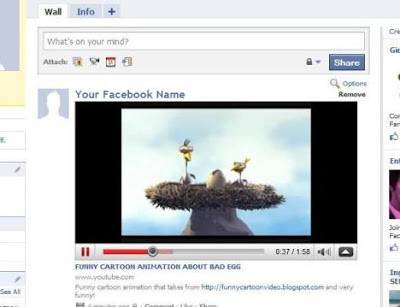 It will show Youtube video box from your favorite video you've uploaded on your wall. It looks looks like the image below. If you're still curious about how the results and how to view the video. Then try to click the video image and will be open videobox Youtube videos that will play you. If you look at the example below the results you will definitely agree if you wall becomes very attractive. In addition to these steps there are other ways that can be used. In particular by directly copying the Youtube video URL in your Facebook. To do this, please open your favorite Youtube videos and then copy the video URL. 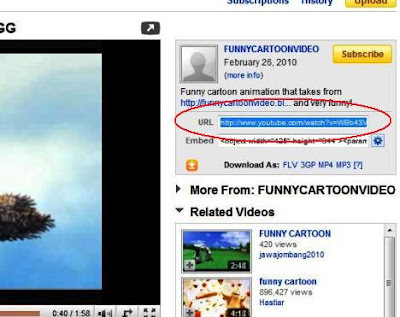 If you are still confused to find Youtube Video URL, try to see the picture below. After that please you visit your Facebook wall. Then the column share or comments, please click icon "links". Then the link will open a window as shown below. If necessary, add your comment in addition to or explanation of the video. Then click "Attach" and wait a few moments until the video image appears. Then click "Share" and fill Security check advance if any. The results generated in this way is similar to the first step. So was the way to play it. How? Are you interested to try it out? CHECK OUR ALL POSTS LINK BY SINGLE CLICK HAVING ALL TYPES OF HACKS AND TRICKS !!! MUST SE REALLY NEW CLICK HERE!!!! How To Know your Pc Is Male or Female ??? What is Spyware and Adware? log trick !! make ur Notepad a diary !! NOTEPAD "world trade centre trick"
Remove Stored username and Passwords ! Speed Up Ur Shut down ! !